The visual spectacle features a top-knotted Rihanna dressed in an orange sari and adorned with henna on a rocky, alien planet and, towards its conclusion, transforming into a stellar entity. Rihanna has released the otherworldly video for her new single Sledgehammer. The aching, Sia-penned ballad first appeared in the latest trailer for Star Trek Beyond. 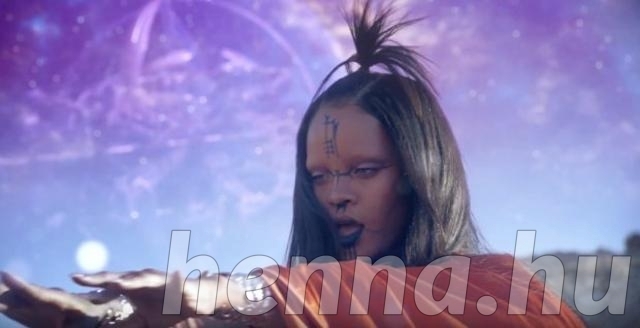 For the magical, epic clip, Rihanna channels the film it soundtracks in alien-esque outfits, at a desert on another planet, slowly moving into the sky as she engages with an orb, becomes multiplied and finally becomes one with the galaxy. Given a cinematic premiere in select IMAX theatres the morning of June 30, the video was directed by Floria Sigismondi of rock drama The Runaways and numerous other video treatments. Sigismondi has previously worked with the likes of Justin Timberlake (Mirrors), David Bowie (The Stars), Katy Perry (ET), Christina Aguilera (Hurt), and Muse (Supermassive Black Hole). Sledgehammer was first released on June 27. The day before, Rihanna had won Best Collaboration at the BET Awards 2016 for Work featuring Drake, which had also been nominated for Video of the Year.